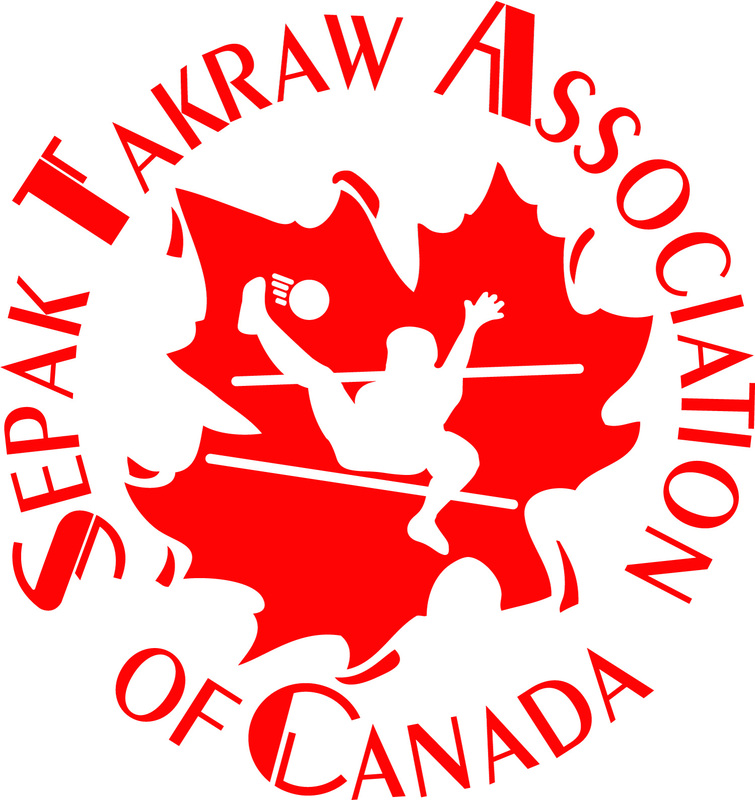 The Sepak Takraw Association of Canada (STAC) is the national governing body for the sport of Sepaktakraw in Canada. It is responsible for all aspects of the sport's growth, development and participation locally, provincially, nationally and internationally. STAC is committed to upholding and maintaining the highest standards of good sportsmanship, player safety, and the traditions and culture surrounding the sport. STAC officially came into being on December 11, 1998, and was the initiative of Rick Engel, the current President, who first started promoting the sport of Sepak Takraw in Canada in 1993. 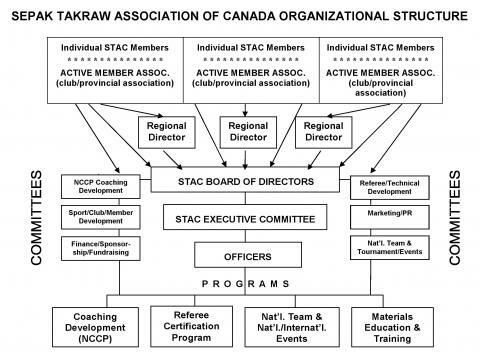 Membership to STAC comes from Individuals, teams, schools, clubs and provincial governing bodies (currently Saskatcewan is the first province to form such). Officers, directors of the board, and those serving on committees are elected from the pool active members involved across the country. 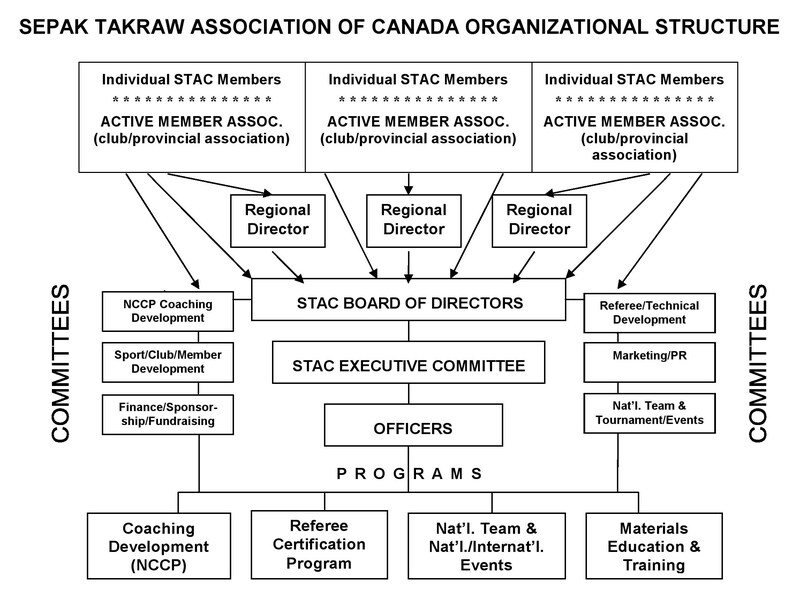 The Organizational Structure Chart below shows how STAC is organized in an ideal world, but not all the committees indicated are currently in place. STAC's most ambitious project of late has been working with the Coaching Association of Canada to develop it's own National Coaching Certification Program (NCCP) material for Sepak Takraw and at the same time is working with Sepak Takraw Saskatchewan to pilot it's Coaching Development, along with the Officials/Referee Development Programs. Due to funding constrainsts and practicality, most of STAC's major administrative decisions are made via Email Board Meetings by an elected board of Directors, and at AGM's by STAC members. On occasion, the board has also sought input from more active members in different regions across Canada before making a board decision. The Sepak Takraw Association of Canada (STAC) is a federal non-profit sports association, but cannot even be eligible for government funding until it has a paid membership of 3000 in at least 8 provinces/territories. Even when such time comes that this requirement is met, Federal Government funding is still not guaranteed. The better and quicker funding solution will likely be through corporate sponsorship, however, all officer and board members' positions are all 100% volunteer … so of course their time contribution does have limits. Presently, STAC's only source of revenue is in memberships, the sales of promotional products and tournament fees … which doesn't go far. Fresh ideas and more volunteers with a willingness to help are always welcome. STAC tries to send a team to represent Canada in a Sepak Takraw World Championship event at least once a year ... but this is always pending sponsorship/funding. Reimbursement for overseas travel to international Sepak Takraw championships has only occurred once … that was when three Regina players were reimbursed air travel by organizers of the World Cup in Malaysia in March, 2000. They were actually scheduled to be the "Reserve Player", "Team Manager" & "Coach" respectively, but the team from Montreal who won the 1st National Sepak Takraw Championships held in Regina and were picked to be the National Team, contacted the STAC office 1 1/2 weeks before departure saying that they could not go. Buying new tickets was out of the question, as they would have been triple the price (way over budget) due to last minute. One of the Regina players was going to give his ticket to a more experienced player, but the airline would not allow it. That's how the Regina trio became Team Canada that year, and that situation is also what prompted the board to develop the National Team Selection Policy. All other times every player has paid their own way out of their own pockets. Until STAC can establish permanent funding and/or a corporate sponsor, players are encouraged to seek their own sponsorship for travel to international events. Local transportation, food and accommodations in the host country are always provided. National team selection is decided from national training camp/tournament attendance and performance (from 2002 onward), consultation with players involved, board of directors and national team coach (presently Rick Engel, who is internationally certified and has gained much experience). STAC's national team policy requires eligible players to be: STAC members; national tournament medallists (or at least competitors); disciplined in training, co-operation and communication (in other words, playing regularly); reliable, dependable and available; able to display high standards of play and skill; easy to get along with other players; and of appropriate height, weight and fitness. In reality, though ALL eligible teams/players are always contacted each year and invited to be the national team to represent Canada, the determining factor has been who was available to go (would take the time off work/school) and willing to pay their own airfare. Since 1999, Canada has held 10 national championships and has sent teams in the Men’s & Jr. Division to 11 World Championship/International Sepak Takraw Tournaments in Asia and Europe. Team Canada came home with a Silver Medal in Division III of the 16th King’s Cup, held in November 2000, and made it to the quarter-finals in a knock-out event at the Malaysian World Cup in October, 2004 and again in 2008, then also again at the 2009 France Open. In December, 2004, Canada's Rick Engel was elected as Vice President of the International Sepak Takraw Federation (ISTAF), and has already played a key roll in bringing improvements to the sport – such as the rally point scoring system that was just introduced in January 2001. The overall vision is to see Sepak Takraw as a future Olympic sport.